Neighborhoods In Tucson Northeast area have a history of ranch and horse properties. The area continues to provide a blend of rural land, ranches and Tucson neighborhoods. Northeast Neighborhoods in Tucson offers homes come in many styles. Ranch, Hacienda and contemporary home styles abound. Home will be on larger more rural lots or in quiet neighborhoods. Northeast Neighborhoods in Tucson will be also have new construction and well established luxury neighborhoods. Homes in neighborhoods in Tucson Northeast will have views of the Catalina Mountain, Rincon Mountains or Tucson City lights. Golfers are close to Arizona National, Forty Niner Country Club and Tucson Country Club. Arizona National and Forty Niner Country Club are semi private. Tucson Country Club is a private club surrounded by many luxury homes. Looking for Tucson Horse Properties OR Tucson Homes For Sale? We can help! Questions on Tucson Real Estate, Tucson Homes or Northeast Tucson Neighborhoods? Give us a call 866 316 5575 OR Submit our handy CONTACT FORM and we will get right back to you! 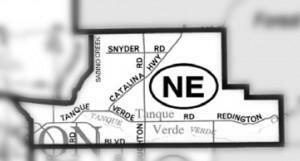 Northeast Tucson Neighborhood homes are located near Redington Pass. The pass is between the Rincon and Santa Catalina Mountain ranges. Two of the five mountain ranges surrounding the valley where Tucson AZ is located. Sabino Canyon is located in Northeast Tucson. Sabino Canyon provides a unique setting for residents and vistors. The canyon provides stark contrasts between the desert and rushing waterfalls coming off the mountains. Nature abounds in this unique setting. Tours and hiking are available. Another unique area in Northeast Tucson is Agua Caliente park. The name means “hot water” in Spanish. The park is just over 100 acres. The warm water creates a habitat very unusual for a desert setting. Spend a few hours of a day. Tanque Verde Guest Ranch is one of last remaining Tucson Guest Ranches. This “dude” ranch has a history dating back to the mid 1800’s. Eastern “dudes” were invited to do every day ranch hand work and relax in the warm Arizona sun. Over the years, the property has evolved to provide guests the feeling of a dude ranch at a Upscale resort. This is a very family friendly place.